Black Mesa is a remake of the 1998 video game Half-Life, developed by a team of fans known as Crowbar Collective. Black Mesa is notable as not only is it a solid remake of what is considered one of the greatest video games of all time, but the project is actually sanctioned by original Half-Life developer Valve Corporation, so much that it was approved for sale on Valve’s digital distribution platform, Steam. Despite an initial release in 2012, however, Black Mesa is still technically in development. The last portion of the game, the Xen borderworld, has been announced and pushed back a few times, since what was originally a December 2017 release date. But, with this new trailer, Crowbar Collective not only teases their own interpretation and expansion of Xen for Black Mesa, but also promises a second quarter 2019 release. While that’s still some months away, it’s great to see something new(ish) related to Half-Life have a tangible release date. 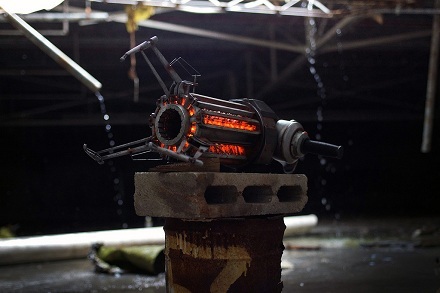 Harrison Krix of Volpin Props developed this replica Gravity Gun for the purpose of auctioning it at a dinner benefiting Child’s Play, a charitable organization. In the words of the creator, his last piece “…fetched a little more than twice what my car is worth…”, so it’s not hard to imagine the price will definitely be above what many would consider reasonable. But hey, it’s for charity, right? Plus, the Gravity Gun is from Half-life 2; greatest FPS ever, anyone?